In June 1942 the US Navy asked Curtiss to design an advanced scouting plane capable of operating on fixed wheel or float landing gear. It was to replace the Curtiss SOC biplane and Curtiss SO3C monoplanes then operated from shoe bases, aircraft carriers, and major warships. Curtiss submitted its Model 97 design in August 1942, but it was March 1943 before two XSC-1 prototypes were ordered. The first of these flew in February 1944 as an all metal low wing monoplane with folding wing and a clear view canopy. In June 1943 the Navy had contracted for 500 examples of the SC-1 production model. These aircraft were delivered from October 1944 as land planes, the alternative alighting gear being bought separately from Edo as a kits of one main and two stabilizing floats. A second batch of 450 aircraft were ordered, but only 66 of these had been delivered before the balance was canceled at the end of the Second World War. Only 10 of the improved SC-2 version were delivered. The last Seahawk were retired in 1949. This is one of the earlier X-otic72 kits so has larger sprue gates than later kits. It also does not have any etched brass or resin parts, which is just fine with me and I generally make a mess of etched brass. 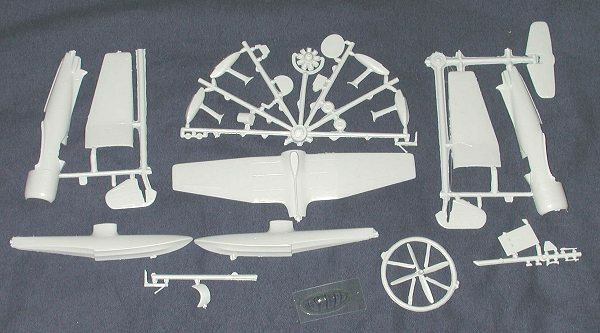 As you can see, many of the parts are not on a single sprue. Actually, they probably once were, but have been cut back somewhat so that they'll be able to fit into the X-otic 72 box. Detail level is very good with fine engraved lines. I saw no real problems with the parts other than a bit of flash and some short ejector towers in the large parts that you may want to remove before construction. No sink areas were noticed, even with the larger pieces. The cockpit is a little on the basic side, but that leaves some room for superdetailing by those who may wish to do so. Beaching gear is provided to ease the problem of display. Instructions are basic but complete with a parts breakdown and two exploded construction views. Due to the simplicity of this kit, they are quite adequate for the job. 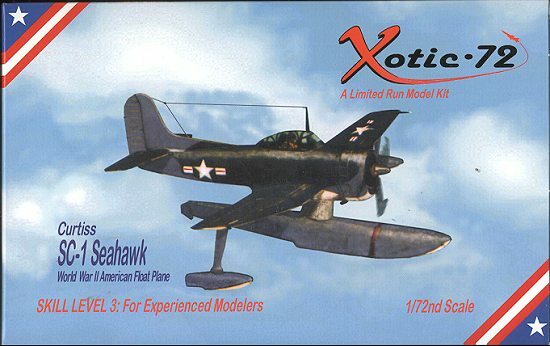 What is missing from this and other X-otic 72 kits (at least the early ones) is any interior color information. I guess that being for experienced builders, we should have a pretty good idea of what colors are needed, but it would still be nice to have them or at least an admission that they don't know. Markings are for two planes. I had to darken the heck out of the sheet to show the white markings as the background is ivory and offers little contrast. You get markings for two planes. Both are postwar and one is a prototype from the Naval Air Test Center at Pax River, MD in the three color scheme. The other is an operational SC-1 aboard the USS Topeka in 1947 in overall dark sea blue. An excellent set of three view drawings is provided to help with painting and decal placement. If you have had any experience with short run kits, this one should prove to be no real trouble. Yes, it will take some of those modeling skills you've been developing, but the end result should be a nice model of an unusual aircraft. Review kit courtesy of the fine folks at Aviation USK Nebraska. Thank you for your support.